Extremely scarce pocket map of New York City. A New Map of the City of New York Comprising all the Late Improvements. A very obscure pocket map of New York City issued in 1831 by J. Langdon of 151 Fulton Street. Oriented to the west, Langdon's map covers New York from Forty Fifth street south to the Battery. This map divides and color codes the city according to wards, of which there are 14. All streets are noted as are piers, slips, parks, and important public buildings including Bellevue Hospital, the West Battery Castle, City Hall, the House of Refuge, the Alms House, and the Penitentiary. In terms of Parks, City Hall Park, Washington Square Park, the Battery, and the Parade (today's Madison Square Park) are noted. This map appeared at an exciting time in the development of New York City and was drawn, as the title suggests, to illustrate the many civic improvement and developments in process. These included the Lower East Side Landfill, commercial and real estate developments in what was then the northern part of New York City (indicated by shading), and the construction of various docks, piers and ferry crossings. At the base of the map there are views of City Hall and the Merchant's Exchange. 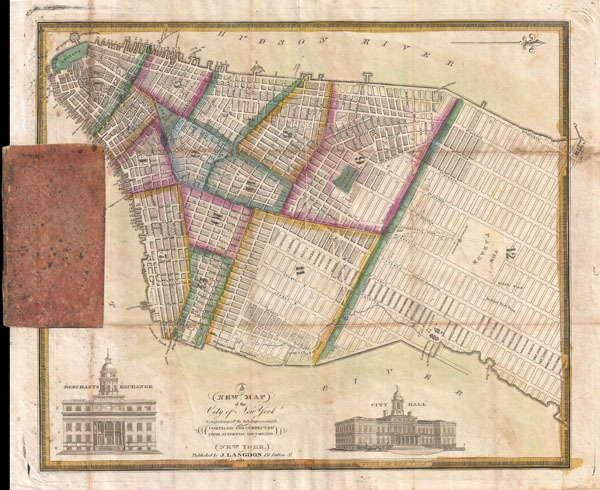 This map appears to be nearly identical to S. Mark's pocket map of the same that was issued in 1827 and folded into J. Hardie's Description of the City of New York. The Marks edition was issued uncolored. Langdon's edition appears to be an independent issue and generally appears with original color. The use of Mark's plan may either represent a sale of the plate to Langdon or outright plagiarism - both of which were common at the time. John Langdon (fl. c. 1790 - 1840) was an auctioneer, bookseller, and part time publisher active in New York during the mid 19th Century. Langdon's publishing ventures seem to have been minimal and associated exclusively with his regular auction offering. Several of his auction catalogues survive including one dated to 1798. Langdon's sole map publication is an rarely seen pocket map of New York City that appears to be either a reissue or an outright theft S. Mark's map of 1827. A John Langdon is known to have been president of the Senate during the investiture of George Washington as President, but it is unclear if it is the same person. Langdon had his offices at 151 Fulton Street, New York City. Good condition. Map has been professinally removed from binder, flattened, and backed with archival paper. Haskel, D. C., Manhattan Maps, A Co-operative List, 715 (Marks, Langdon issue not in Haskell). New York Public Library, Map Div. 01-1768, Map Div. 01-479.